Recent rumors suggest that Apple has been researching a new display type known as MicroLED for several years, and is quite far along. We could start seeing Apple-produced MicroLED displays in Apple Watch within the next two years, with phones and maybe even tablets to follow. Be cautiously optimistic about this new display technology. MicroLEDs have the potential to be superior to OLED in many ways, and could be the dominant display technology in new products in a decade. Here’s why MicroLED is worth getting excited about. One of the big advantages of OLED displays over traditional LCDs is that they’re thinner, and MicroLED should be thinner still. Traditional LCD screens, like those on every iPhone (except the iPhone X) and iPad, are comprised of several layers. The little red, green, and blue sub-pixels don’t actually emit light. Rather, there are red, green, and blue filters in front of a white backlight, with a liquid crystal layer between them. Add in polarizers and glass substrates and you’ve got a relatively thick display sandwich. OLED dispalys require fewer layers than LCDs, and are therefore thinner. MicroLED is thinner still. OLED displays use organic compounds that emit red, green, or blue light when a current is passed through them. So, the little sub-pixels emit their own light, and no backlight is needed. You also don’t need the liquid crystal layer, and only one polarizing layer. Hence, the display is a lot thinner. Micro LEDs are similar to OLEDs, but they use a gallium nitride inorganic material, similar to what is found in traditional colored LEDs. In fact, they’re a lot like regular colored LEDs, only shrunk way, way down. Because the little sub-pixels are emissive (they create their own light like OLEDs), they don’t need a backlight or liquid crystal layer. But they also don’t need a polarizer at all, and only a thin glass layer on top. They can be even thinner than OLED, and much thinner than regular LCDs. The super small LEDs in MicroLED displays are more efficient at turning electricity into photons. Basically, they produce more “brightness per watt” than either traditional LCD or OLED displays. It’s still a new product that hasn’t been fully commercialized yet, but some estimates say that MicroLED should use about half the energy as OLED to produce an equivalent brightness. Other estimates say the energy savings will be much greater. That’s good news for any device, because the display is one of the biggest battery drainers today. But it’s especially welcome in tiny devices like Apple Watch, where there’s no room for a bigger battery. With MicroLED, an Apple watch could be slimmer without sacrificing its all-day battery life. LCDs and OLED displays don’t differ all that much in their maximum resolution. The Sony Z5 Premium crammed a full 4K resolution into a 5.5-inch display—a stunning 806 pixels per inch. Though not in a product yet, Google and LG have developed an OLED display for VR that measures 4.3 inches and boasts 18 megapixels. That’s a whopping 1443 pixels per inch. There have been no commercial MicroLED products released, but the individual red, green, and blue LEDs can be, well, microscopic. We’re talking about less than 100 microns. It has the potential for many times the resolution of either traditional LCD or OLED. We’re talking “full 4K display on an Apple Watch” resolution, or several thousand pixels per inch. The first MicroLED displays are almost certainly not going to be that high-res, but the technology is capable of that resolution and more. 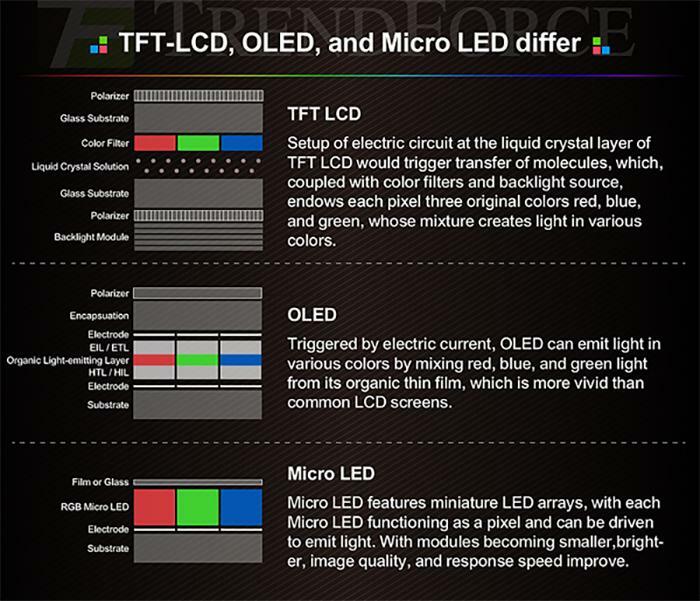 A cross-section of LCD, OLED, and MicroLED display layouts. You may have heard of OLED screens displaying “burn in.” Basically, when the display shows the same image in the same place for a very long time, it starts to leave a “ghost” of itself so you always see it there. It happens on all sorts of screens; the LCD on your car dashboard may have faded interface elements that just don’t go away. The LEDs in MicroLED displays are far less susceptible to this than the organic compounds in OLEDs, or the liquid crystal layer in traditional LCDs. Burn-in shouldn’t be a concern for most MicroLED products. This LCD in a McDonald's was tuned to CNN all day every day and now has burn-in where the logo was displayed. One of the big advantages of OLED over LCD is the technology’s very fast switching times (the time it takes for each pixel to fully change color). 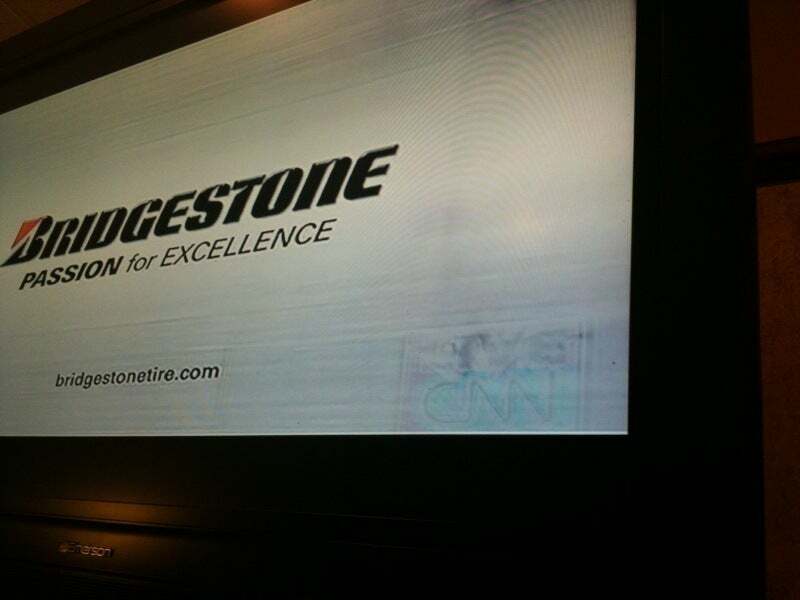 Slow switching times can result it blurring and smearing when objects quickly across the display. The best LCDs can fully switch colors in a few milliseconds (thousands of a second). OLED displays have switching speeds measured in microseconds (millionths of a second). 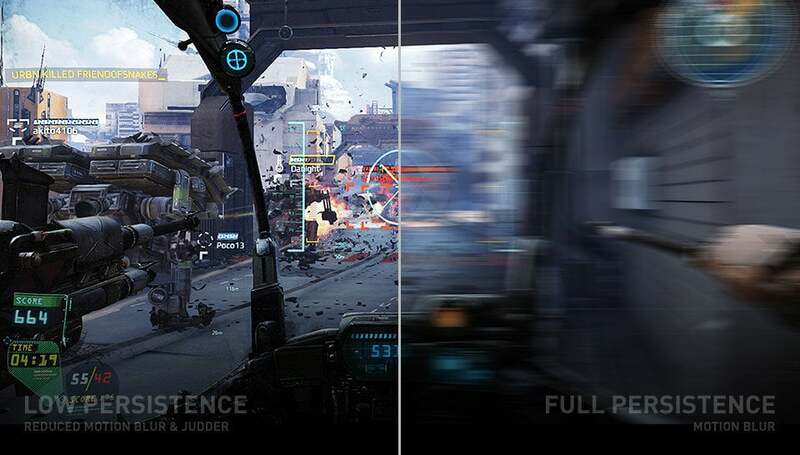 That’s why they’re used in VR headsets, feature high refresh rates and “pulse” the pixels one for just a brief fraction of each frame. LCDs just don’t switch fast enough for a good VR experience. MicroLEDs have switching speeds that sound more like microchips than displays—they’re measured in the nanoseconds (billionths of a second). The super high resolutions in tiny sizes, combined with ultra-fast switching speeds, make MicroLEDs perfect for VR and AR headsets. VR displays pulse on and off very rapidly for "low persistence" to reduce blurring. OLEDs are great for this, and MicroLEDs will be even better. Again, there are no consumer products to test yet, but MicroLEDs should be capable of producing brighter displays with near-infinite contrast ratios (because black pixels are entirely off), making them fantastic for HDR. The much higher maximum brightness will make MicroLED displays much easier to read in direct sunlight, too. 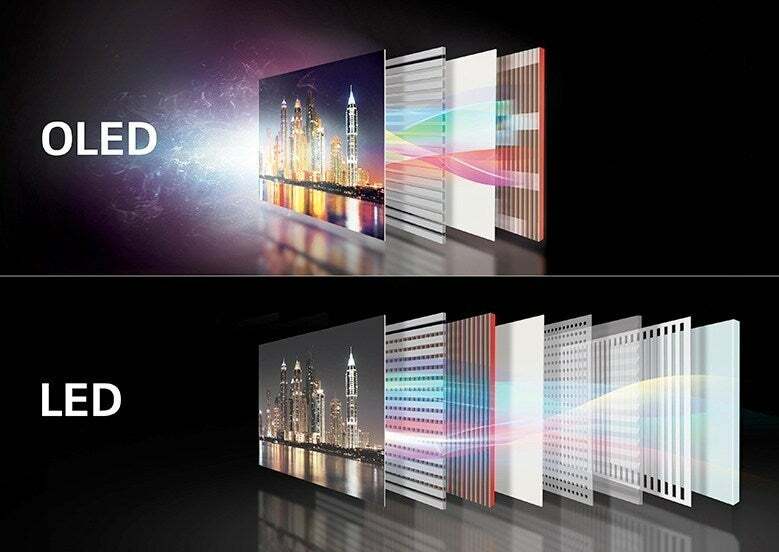 MicroLEDs are said to be capable of a broader range of color, which means wider color gamuts, and they can be more precisely controlled for better color accuracy. If there’s a downside to MicroLED, it’s cost. The LEDs are manufactured almost like silicon chips, and then transferred onto a backplane full of tiny gates to control the electrodes that connect to the LEDs. It’s like transferring parts of a computer chip onto another computer chip. This is done over and over again in batches, and errors are possible at every step. Until production really scales up, MicroLEDs are going to be expensive; some estimates say three to four times as expensive as OLEDs. Eventually, if a lot of large-scale MicroLED factories come online and the manufacturing process becomes more reliable, the cost should drop quite a lot, eventually reaching parity with OLEDs and potentially even as low as high-quality LCDs. According to Bloomberg’s report, Apple has been working on this technology in a secret lab since it purchased MicroLED research firm LuxView back in 2014. For years, Apple has been working on a process to create consumer-grade MicroLEDs in a 62,000-square-foot manufacturing facility. Apple can apparently produce all parts of the display, including the backplanes, TFTs, and screen drivers. The research facility, Bloomberg claims, can turn out “a handful” of fully operational MicroLEDs at a time of the size needed for an Apple Watch, though they are not actually integrated into Apple Watches. It appears that it is Apple’s intention to develop a process to efficiently produce consumer-ready MicroLEDs, starting in the Apple Watch size, and then contract actual production out to a third party with much bigger facilities. The Bloomberg report makes it sound like an Apple Watch with a MicroLED display is probably not coming this year, but may very well land in 2019 or 2020. 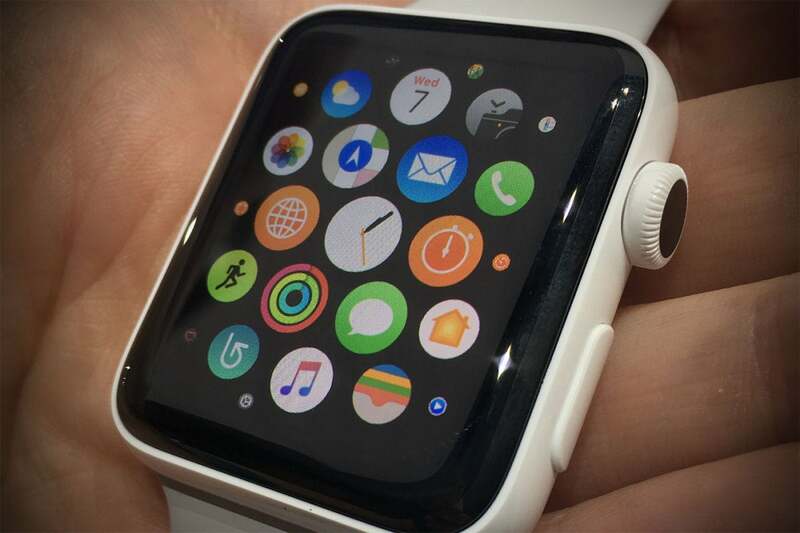 If the technology were to appear in an iPhone, it would likely be two or three years after its Apple Watch debut.